The QHY12 with 14.2 Megapixels is the highest resolution in the QHYCCD cooled APS size color CCD family. The CCD sensor is Sony's ICX613 Super HAD sensor which has very low thermal noise and readout noise. 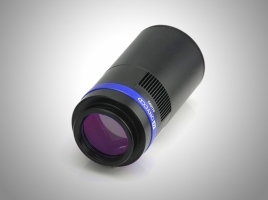 If you have a Hyperstar telescope, the QHY12 is a very good choice. Its small diameter will not obstruct the entrance beyond the secondary. The small 5.12um pixels will yield higher details of deep space objects.